What made you decide on 285s mate? 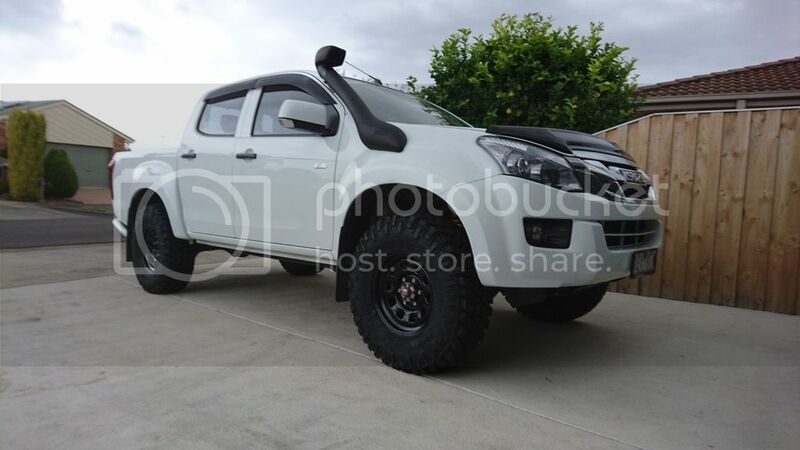 Not really suited to the Dmax, they do look awesome though. Got pictures? Do you rate the aftermarket exhaust? Sorry everytime I try to upload a pic says it's to big. Now I've had them I won't do it again I'll go 265. 285 hitting my body mount on full lock with 20+ offset. In saying that it's not to bad went bush all last weekend and went absolutely awesome. I've got something like 380mm on clearance underneath with them tyres haha so thts good. Big tyres so they hit the body , I guess that's one way of reducing the steering lock and perhaps save you breaking CV's ( I'm not serious ) . upload picture to Flickr, it is free. Post link to picture in message. I had a brief look. If you are on photobucket, there is a chain icon, click on that for links, tap to copy the IMG code, come to your post on here and paste the code into your post.